ASX 200 “..super Thursday failing to sustain positive the vibe from overseas” Henry Jennings, Australian Market Wrap. Headlines, Stocks & Sectors, Bonds, Economic & Asian Market News – END of DAY REPORT. Company results continue to dominate with super Thursday failing to sustain positive the vibe from overseas. ASX 200 fell after early strength as the banks gave way, closing down 4 at 6059 on good volume. The AMP CEO should taken the day off, as the longer he spoke the lower the share price went. Long road back. TLS offers more questions than answers as Andy Penn bets the future (still) on cost-cutting and 5G. Miners and energy stocks benefitted from higher commodity prices, whilst SUN underdelivered on weather issues. Some stunning performers inclduing BRG and MFG. Losers, URW falling a huge amount for a REIT. AUD relatively stable as Chinese data shows improvement and a move away from US exports. ASX 200 slips from early gains to close down 4 to 6059. High 6094 Low 6047. Nearly the same range as Tuesday and Wednesday. Banks lose appeal. AMP shocker. Miners again back in favour S32 cheers. Energy stocks enjoy higher crude prices. TLS fails to answer the sceptics. BRG smells the coffee and CSL bounces. Asian markets back with China up 1.25% with Japan closed for a holiday. AMP -7.79% new CEO should never have talked. Just got worse. BRG +18.01% great result. All systems firing. CWY +13.11% where there is muck there is a lot of brass. JIN +2.10% big jackpot tonight. NEA +4.26% getting silly now. URW -8.39% challenging environment. Negative update. SUN -3.78% rain hail and shine no good for claims. PGH -7.72% brokers continue to shun. AAC -4.04% bull rally falters. CCX +39.52% great results and special dividend. Downsizes to greatness. Speculative Stock of the Day:African Gold (A1G) +50.00%. First day of trade. Seems popular. Good volume too. Biggest Risers – BRG, CWY, MFG, JMS, PMV, APT and GDI. Biggest Fallers – URW, AMP, PGH, KDR, AMA, HSN and NEC. Telstra (TLS) –2.18% Results this morning with H1 NPAT A$1.23bn slightly lower than consensus but not much. Revenue was down to $12.59bn against forecasts of $12.79bn Dividend is all important with 5c ordinary and 3c special dividend. This is consistent with previous guidance on payout ratios. The company has importantly guided to an EBITDA of $8.7bn-$9.4bn with $1.5bn-$1.7bn coming from one-off nbn definitive agreement receipts. The underlying business performed well. During 1H19 Telstra added 239,000 additional retail postpaid mobile services, including 115,000 services on Belong. Telstra Wholesale added 125,000 mobile services that were a mix of prepaid and postpaid. Penn talked about ‘challenging times’, increased capex to take advantage of opportunities and increased costs for redundancies. Free cash flow is likely to be at the bottom of the range due to this capex expenditure. The company is on track for productivity gains. AMP Limited (AMP) –7.79% Full-year results. Underlying profit came in at $680m, consistent with guidance provided on January 24. Revenue was down 55% to $8.29nm and net profit attributable to members was down 97% to $28m. A final dividend of 4cps was announced. Treasury Wine Estates (TWE) +0.60% First half NPAT was a slight beat at $219.2m versus an expectation of $219m. Net sales revenue and EBITS beat market consensus coming in at $1.54bn and $338.3m respectively. TWE reiterated FY19 guidance, they expect EBITS growth of around 25% year on year. Goodman Group (GMG) +4.25% First half operational profit came in above market estimates of $453.6m, at $465m. Operational EPS guidance lifted 1.1c to 51c. full-year forecast distribution of 30cps maintained. Woodside Petroleum (WPL) +1.92% Results look OK, perhaps a slight miss overall. Underlying NPAT $1.42bn vs $1.45 expected. Operating Revenue $5.24bn vs $5.06bn expected. Final div 91cps. Outlook: capex $1.6-1.7bn. Exploration expenses in 2019 will reduce to $200m, from $310m in 2018. ASX Limited (ASX) +0.99% Numbers looks strong with first-half underlying NPAT at $246.1m versus expectations of $239.4m. Revenue from ordinary activities jumped 7.9% over the year, with operating revenue coming in at $424.7m versus $398.7m a year ago. The interim dividend jumped 6.7%, to 114.4cps. Newcrest Mining (NCM) –1.38% First half Statutory profit up 142% on year to $237m. Revenue missed market estimates of $1.79bn, coming in at $1.73bn. FY19 guidance unchanged, capex is expected to be at the low end of the guidance range and gold production in the second half is expected to be higher than the first half, due to few planned shutdown events. South32 (S32) +3.54% Result looks like a beat. First-half underlying NPAT came in above expectations at $604.5m vs $604.5m. Revenue and underlying EBITDA also best estimates at $3.81bn and $1.31bn respectively. An interim dividend of 5.1c per share was announced along with a special dividend of 1.7c per share. FY19 outlook confirmed, the group expects production volumes to rise by 5% in FY19. Magellan Financial Group (MFG) +9.90% First half adjusted NPAT was 3.5% above estimates at $176.3m. Revenue also beat expectations at $276.4m. Average funds under management up 34.5% on year to $72.1bn. An interim dividend of 73.8c per share was declared. Healthscope (HSO) – First half operating NPAT missed estimates of $74.6m, coming in at $82.5m. Revenue and operating EBITDA also fell short of expectations at $1.22bn and $198.1m respectively. An interim dividend of 3.5c per share was declared. HSO said it continues to target FY19 hospital operating EBITDA growth of ‘at least’ 10% compared to FY18. 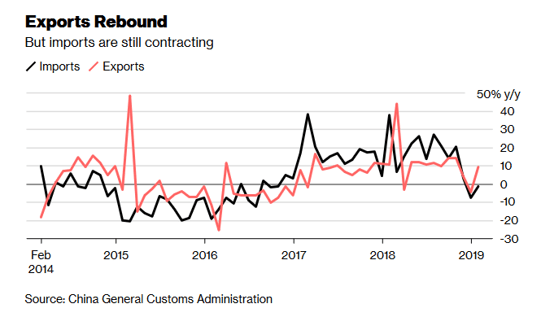 Chinese Exports rose 9.1% in January from a year earlier to US$$217.6bn while imports fell 1.5%, leaving a trade surplus of $39.2bn. 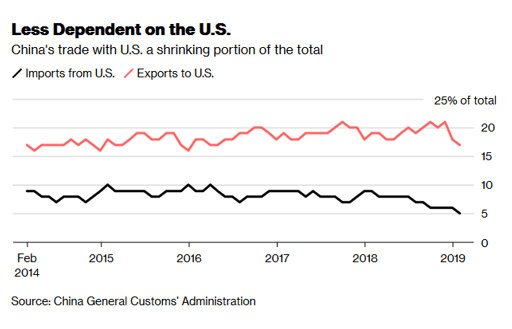 Trade with the U.S. declined in January despite the trade talks, with exports to the U.S. in dollar terms dropping by 2.4% from a year ago, and imports slumping by more than 41%. Japan returned to growth in the fourth quarter of 2018 as the economy recovered. Trump is considering a 60-day extension to the 25% trade tariff rise. Looks like the can is being kicked down the road. Emirates is cutting its orders for the Airbus A380. EU economic output came in at 0.9% between November and December with some countries hard hit- Italy’s output fell by 5.5% and Spain’s by 6.7% at the end of last year. Dutch PM warns of disaster in a No-Deal Brexit. Sees benefits for EU as company shift operations. 43 days to go. Biggest game of chicken in town. One night a man walks into a bar looking sad. The bartender asks the man what he wants. The man says “Oh just a beer”. The bartender asked the man “Whats wrong,why are you so down today?”. The man said “My wife and i got into a fight,and she said she would’nt talk to me for a month”. The bartender said “So whats wrong with that”? The man siad “Well the month is up tonight”. Henry Jennings, Marcus Today Australia on Earnings, Afterpay & ZipMoney.